Vanguard Prime Money Market Fund: A Good Place to Keep Cash? If you have some cash you'd like to preserve, this could be a better option than a savings account. The Vanguard Prime Money Market Fund (NASDAQMUTFUND: VMMXX) is one of Vanguard's lowest-risk investment options. Best for short-term savings, the fund offers competitive interest rates and a stable share price. However, for investors seeking any acceptable level of long-term investment performance, it's generally best to look at other options. What is the Vanguard Prime Money Market Fund? The Vanguard Prime Money Market Fund is designed as an alternative to keeping money in cash, or in a savings account. The primary objective is to preserve investors' principal by maintaining a portfolio of short-term, high-quality assets. This includes CDs, short-term U.S. Treasury Bills, and other money market assets. 100% of the fund's investments are of top credit quality (in the top two possible credit categories), and the average maturity of the fund's assets is just 39 days. The fund maintains a share price of $1.00 at all times and makes income distributions on a monthly basis. Since the fund invests in short-term money market instruments, it tends to pay a relatively low yield, but it can fluctuate considerably depending on the interest rate environment. As of this writing, the fund's distribution yield is 0.48%, but it has been as low as 0.01% in recent years. However, the fund's average return since its 1975 inception has been 5.18%. When interest rates normalize, the fund's yield should rise to a level closer to that historic average, and as you can see, there have been times in the past when the fund's yield was significantly higher than the average. 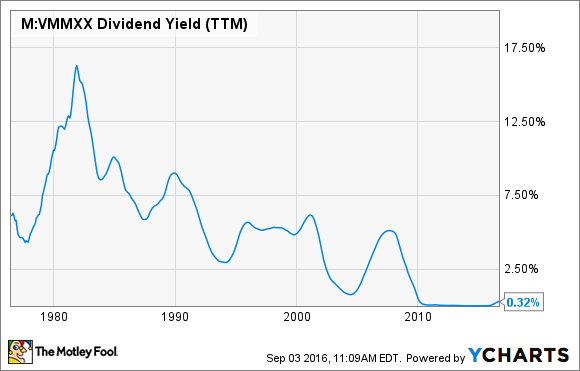 VMMXX Dividend Yield (TTM) data by YCharts. The fund's current expense ratio is 0.16% and requires a minimum $3,000 initial deposit. For investors with extremely large stockpiles of cash ($5 million or more), the fund is also available in Admiral Shares, which have a lower 0.10% expense ratio. Investors have the ability to transfer money electronically to and from their bank account, so the fund is designed to be just as convenient as a savings account, but with a slightly higher yield. Stability: The fund maintains a $1.00 share price. In other words, the risk of losing your investment principal is virtually zero. Liquidity: The shares can be readily redeemed for $1.00. Low cost: The fund's expense ratio is just 0.16%. Income: The Vanguard Prime Money Market Fund pays a better yield than most savings accounts, checking accounts, and short-term CDs do. Although the fund's current annualized yield is only about 0.50%, it's far better than the sub-0.10% returns many savings accounts are offering. Monthly income: The fund distributes income to investors on a monthly basis. This could become a more attractive benefit once interest rates normalize, but it's still better than having to wait for a quarterly or annual payout. Low yield: Compared with bonds and dividend stocks, money market assets don't pay very much. Investors who want income on a long-term basis can get significantly higher checks by investing in bonds, without taking on much more risk. Purchasing power decline: While the fund generates some income, it's important to point out that its returns are unlikely to keep up with inflation, especially in the near term. For example, if the inflation rate is 2% and the fund returns only 0.5%, your investment is actually losing 1.5% in purchasing power each year. No principal appreciation: The Prime Money Market Fund maintains a $1.00 share price, no more, no less. So, while you won't lose money, you don't have the potential to make any either. Who should invest in the fund? I'd recommend the Vanguard Prime Money Market Fund as a short-term investment vehicle only. For example, if you have $10,000 that you know you'll need in two months to pay for your kid's college tuition, the fund is a good way to ensure that you won't lose any of it, and to generate a little bit of income at the same time. Or, if you have some emergency savings and don't want to risk losing any of it by investing, this could be a good option. As far as a long-term investment, I suggest that virtually 100% of all investors' portfolios be in either stocks or bonds (or funds that invest in them). Stocks provide the growth younger investors need, and bonds can provide the income retirees need without excessive risk. If you're retired and feel more comfortable with some cash, this could be a good option for a small percentage of your portfolio, but that's about it.